Robert Allessandro Wins the $500 Deep Stack Event! After a four-way equity chop, Robert Allesandro is officially the winner of the $500 Deep Stack event. He takes home $21,436, the World Poker Finals Trophy and the watch! The turn is the [4c] and the river comes the [7h]. Araugo's pair of jacks hold up to win the pot and eliminate Trojan in 5th place for $7,277. Little has Allessandro drawing thin but the board runs out [5d][3d][2c][Qh][4d]. Allessandro spikes his queen on the turn to win the pot and eliminate the former World Poker Finals Main Event Champion in 6th place for $5,888. The board runs out [As][Kh][Qc][Th][Ks] and Araugo wins the pot to eliminate Raptis in 7th place for $4,895. The board runs out [Ts][8d][6d][5c][5s] and Allessandro's pocket jacks hold up to win the pot and eliminate Riggs in 8th place for $3,970. Marc Pages Wins the $230 Super Bounty Event! Congratulations to Marc Pages, winner of the $230 Super Bounty. After a four-way chop, Pages takes home the title as well as $7,606. Robert Allessandro raises 55,000 before the flop and Luke Serafin moves all-in for 105,000 total. Joe Araugo calls and Allessandro tosses in the extra 50,000. The flop comes [Qd][8d][7d] and Araugo checks. Allessandro bets 100,000 and Araugo thinks for a few minutes before folding pocket jacks, with the [Jd], face up. The turn is the [9d] and the river comes the [5h]. Allessandro's pair of queens holds up to win the pot and eliminate Serafin in 9th place for $3,253. The board runs out [Ks][7c][3c][Ac][Jd] and Riggs rivers a set to win the pot and leave Scellato with only 6,000 in chips. Just a few hands later, he is eliminated in 10th place for $2,249. Jonathan Little, who won the 2008 World Poker Finals Main Event for over $1,100,000, is the chip leader going into the final table. 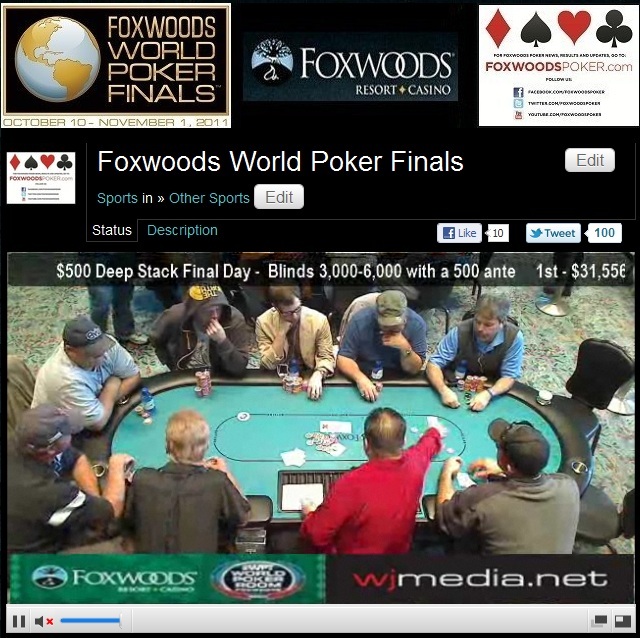 We had a total of 106 players in the $2,500 NLHE event at the Foxwoods World Poker Finals. Much talk has arose about the use of an iPad at the tables. In the photo above, Jon Aguiar shows exactly what is allowed. You can have your iPad at the table as long as it is not being used for any phone-type functions (iMessage, Skype, ect.). It is fine to use for music, games, movies or any other function. Per Connecticut Gaming Commission rules, you cannot have it sitting on the table. But, it is perfectly legal to have it in your hands or lap. $500 Deep Stack Now in the Money! The $500 Deep Stack event is now in the money and all players are guaranteed at least $1,084. You can watch the live feed of all the action by clicking "Watch LIVE Video" at the top of the page. Day 2 of the $500 Deep Stack event is now streaming live. Jonathan Little is among the chip leaders going into Day 2 and is seated at the feature table. The $2,500 No-Limit Hold 'em event is about to get underway. Players are starting with 25,000 chips and the levels are 60 minutes in length.